Clean and dry the basil leaves. Add chicken in its coconut milk marinade. Cook for 5-7 minutes or until chicken is no longer pink. Reduce heat to medium-low. Add in a bit more coconut milk (if desired). 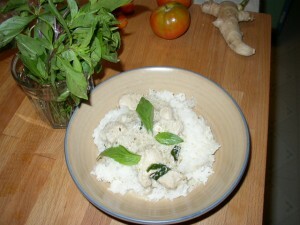 Stir in fish sauce and basil leaves. Serve over Thai Sweet Sticky Rice.